Welcome to www.racingstripes.info . This site serves as the information and car gallery source for our two online stores, www.vinylstripes.com and www.rallystripes.com. Both stores belong to us and the kits are the same. We use only 3m material for our striping. The stripes we sell can be applied wet or dry. A wet application using mild soapy water is simple and forgiving. You can click here for application instructions and videos. On the right you will also find car specific posts that contain pictures and recommended stripe sizes for different automobiles. We also give recommendations on color based on the color of the car. For example, the car to the left uses red on white. An excellent choice. For all cars we have generic kits that consist of a roll of striping, an optional roll of pinstriping and a squeegee. For Mustangs, Camaros, Firebirds, Trans Ams, S10 Trucks, and Monte Carlos we have precut kits as well. 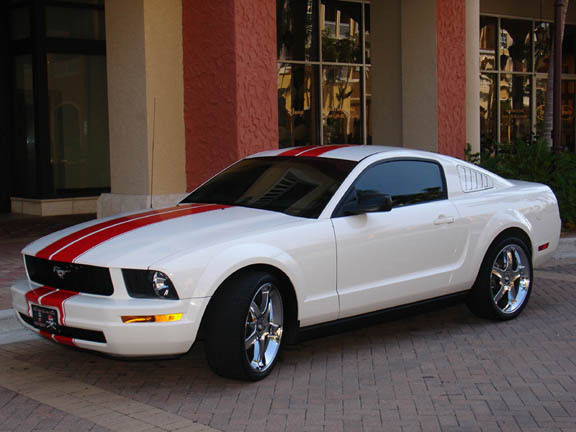 At our www.vinylstripes.com site we carry several widths of striping to accommodate large or small vehicles. We carry a 6″, 8″, 10″ and 12″ width in both 30′ and 36′ lengths. A 30 foot kit will create a dual stripe on the hood, roof and rear deck of almost all cars. 36 foot kits are for going down the bumpers with a dual stripe as well. We also have specialty kits for the Mustang, Camaro, Monte Carlo, Firebird and Small Trucks. We also carry full 150 foot rolls of vinyl striping in 1/4″ up to 12″ widths.